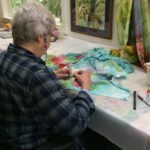 Volcano Art Center announces Ānuenue, a fine art exhibition featuring silk paintings and scarves by Clytie Mead and glass by Hugh Jenkins and Stephanie Ross. The exhibit will open to the public on April 1st and continue through May 14th, 2017 at the Volcano Art Center Gallery in Hawai`i Volcanoes National Park. An opening reception with the artists will be held on Saturday, April 1st from 5 to 7pm. Ānuenue, the Hawaiian word meaning rainbow, refers to a multicolored arc in the sky caused by the refraction of light within droplets of water in the air. Ānuenue appear more frequently in Hawai‘i than in many other places due to the fact that Hawai‘i is surrounded by water. To many Hawaiians, the ānuenue is the sign of an ali’i being near. Hawai`i is well known for its beautiful frequent rainbows. The exhibit reflects upon the abundant spectrum of colors within Hawaii’s frequent ānuenue and its many varying landscapes. The artists have focused on the colors presented within the life-giving blend of the sun and rain, while exploring very diverse media. Award winning artist Clytie Mead received a Bachelor of Fine Art in painting from Carnegie Mellon University and a Masters of Art in Architectural History from Cornell. Clytie works in a number of media, including traditional watercolor, however watercolor on silk is her favorite. This Asian technique combines with a western artistic vocabulary to form the style she is best known for. Inspired by the abundant beauty of the tropical paradise she lives in, Clytie paints flowers and indigenous plants. Some designs incorporate birds, butterflies, and even land snails. Her recent work includes tapa design borders. In featuring less well-known native flowers, the artist’s goal is to draw attention to rare and often endangered treasures of Hawaii. In this exhibit Clytie is focusing on the ohia lehua blossom which is newly threatened by the devastating fungal disease, Ceratocystis Fimbriata. Cyltie states “I have painted a series of five painting of lehuas to bring awareness to the plight of this flower that is so important in the Hawaiian culture. Never has the native forest been more in need of the magic healing powers of ānuenue. I encourage all to appreciate them in a way that will not spread this horrible disease.” Clytie now lives and works in the rural community of Ahualoa with her husband. 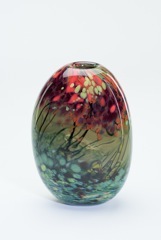 Her work has been exhibited in Hong Kong and Japan and is many private collections in Hawaii and the U.S. In conjunction with the exhibit, Clytie will demonstrate silk painting on scarves on Mother’s Day, May 14th. 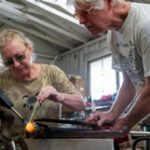 The free demonstration takes place from 11am to 1pm on the lanai of the Volcano Art Center Gallery in Hawaii Volcanoes National Park.